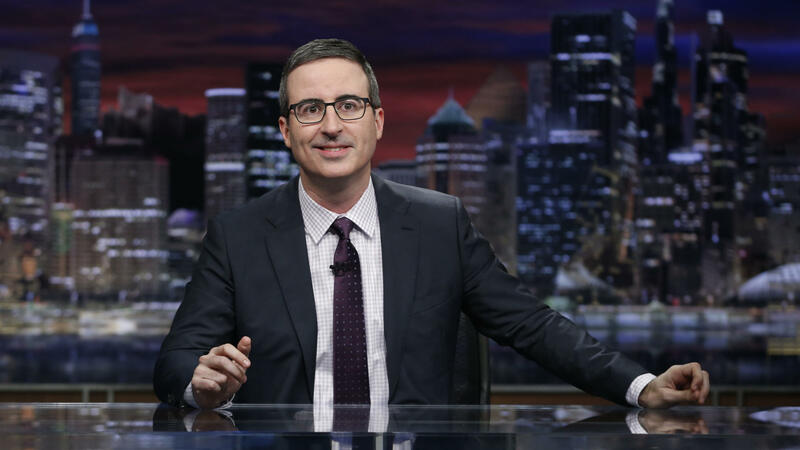 John Oliver's HBO show, Last Week Tonight, returned for its fifth season in February. John Oliver jokes that his satirical news show, HBO's Last Week Tonight, does a 22-minute deep dive on news that "no one in their right mind wants to hear about." In recent weeks, the show has covered, among other things, the Italian parliamentary elections and NRA TV, an Internet channel with NRA programming. "We like the idea of not just regurgitating stuff people have already seen," Oliver says. "The truth is, if you dig deep enough on anything, everything is interesting. So you just have to get to the point of a story where it becomes fascinating." Oliver, who first became known as a correspondent on The Daily Show, started his HBO show in 2014. He describes the style of his long-form, heavily researched segments as "the slowest improv you've ever seen." We have researchers, we have footage producers. And they go away to look at a story and to check that it has been reported accurately, or whether the story has shifted in any way ... and whether there is footage through which we can tell the story. Then once we feel like the basic foundations are solid, then we can kind of bring comedic writing to that process and work out how we'll tell the story — what elements of it we want to use, what kind of story arc we want to employ — and then we write jokes. So jokes come late. The fascinating thing for us there was to try and show — not just tell — people that this was possible. It's theoretically alarming to have someone say, "And it's completely legal to do this!" It's kind of viscerally affecting when you have someone say, "Give me your money. I will cure your lupus. Give me your money. If you do, you will get more money in return. Seriously. Give me your money." People sent thousands and thousands and thousands of dollars to us [which were ultimately donated to Doctors Without Borders]. ... Once they sent money, we sent them letters back — the kind of letters that we had been receiving from the [televangelist] pastor that we had been in contact with over the previous six months. He had an outline of his hand, and you could put your hand on his hand and pray with him that way. So we had, I believe, an outline of my rear end, so that you could sit where I sat and we could pray together. We kind of got into a correspondence with people. Then we eventually had to shut it down, because it would've become our entire job. The point of it was to show that the barrier of entry to this is too low and when it's this low, you can have bad actors enter. I really love it here. I chose to be here. ... Even though I'm not a very optimistic person, I still have a fundamental faith that America will correct this path, because it has to. Heidi Saman and Thea Chaloner produced and edited the audio of this interview. Bridget Bentz, Molly Seavy-Nesper and Nicole Cohen adapted it for the Web.